Running from September 19 to October 16, “Focus Kazakhstan: Post-nomadic Mind” at Wapping Hydraulic Power Station in London shines a light on Kazakhstani contemporary art through parallel dialogues between contemporary artists, their Soviet predecessors, and the rise of post-nomadism—more on that later. 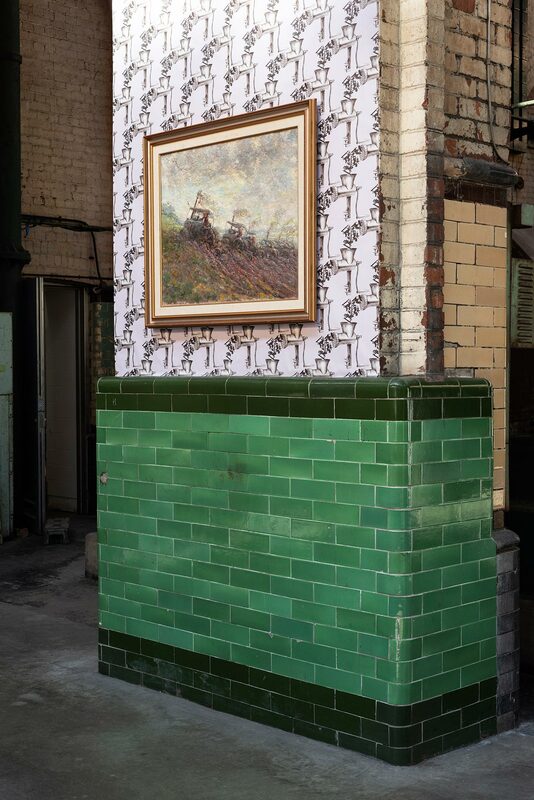 Working in different mediums, including painting, photography, sculpture, installation and video, but united by their post-modernist sensibility, the 32 artists who have taken over the industrial premises explore a variety of themes such as nationalism, traditionalism, consumerism, feminism, and post colonialism. 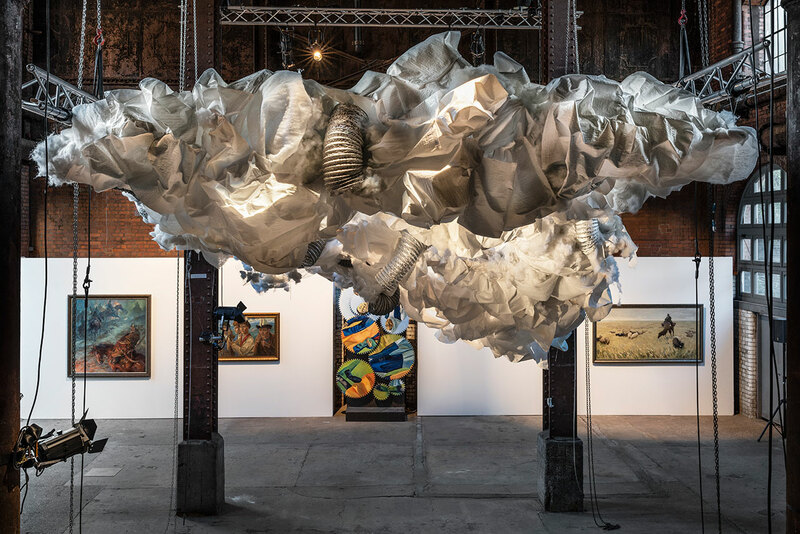 The show is the first part of “Focus Kazakhstan”, a four-part exhibition organized by Kazakhstan’s National Museum that will tour through Germany, the USA and South Korea over the next 6 months in order to promote the country’s modern and contemporary art. The art history of Kazakhstan, and by consequence its contemporary art scene, is directly related to the region’s tumultuous history which the exhibition draws from in a series of dialogues between modern and contemporary Kazakhstani artists. In the mid-16th century, centuries of traditional nomadic life gave rise to the Kazakh language and culture which was greatly influenced by nomadic and shamanistic practices. The native culture was challenged by the introduction of the western fine art tradition in the 19th century by the conquering Russian Empire and later completely suppressed during the cultural hegemony of the Soviet Union. The post-Soviet era ignited a search for a national identity that drove local artists away from established methods, while the age of globalization has spurred an effort to re-engage with the region’s primordial culture through the prism of historical and mythological nomadism. In this sense, post-nomadism refers to the effort of contemporary Kazakhstani artists to re-imagine nomadism and construct a new post-Soviet identity. Focus Kazakhstan: Post-nomadic Mind, installation view of Askhat Akhmedyarov's project "Azhenin Kozi". Photo by Thierry Bal. 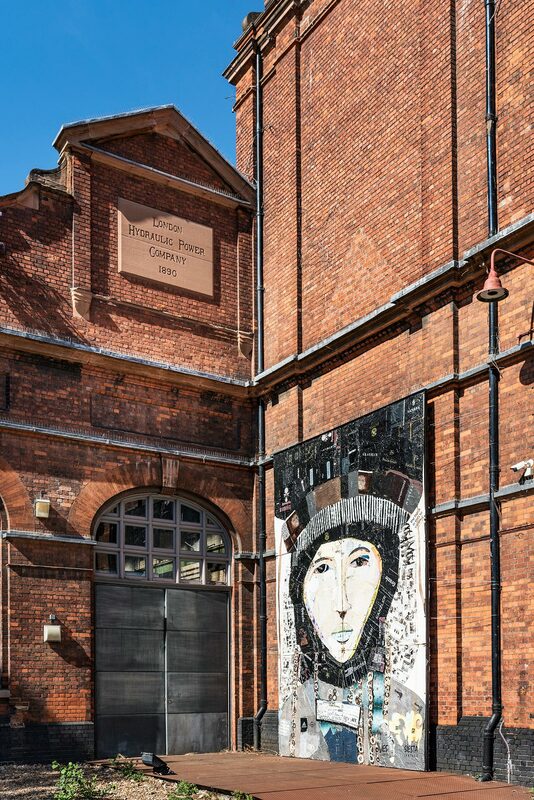 The exhibition, which is curated by Indira Dyussebaeva-Ziyabek and Aliya de Tiesenhausen alongside assistant curator Alima Boranbayeva and consultant Olya Sova, fittingly starts with Saule Suleimenova’s immense 6m high collage that hangs next to the building’s entrance. Titled “Kelyn” (2015), the piece is a reproduction of an archival photo of a Kazakh bride made out of discarded plastic shopping bags glued onto a polycarbonate sheet. The imposing multilayered portrait of an archetypal Kazakh bride evocatively references the multiple cultural, national and linguistic layers that make up the artist’s ‘Kazakhness’. 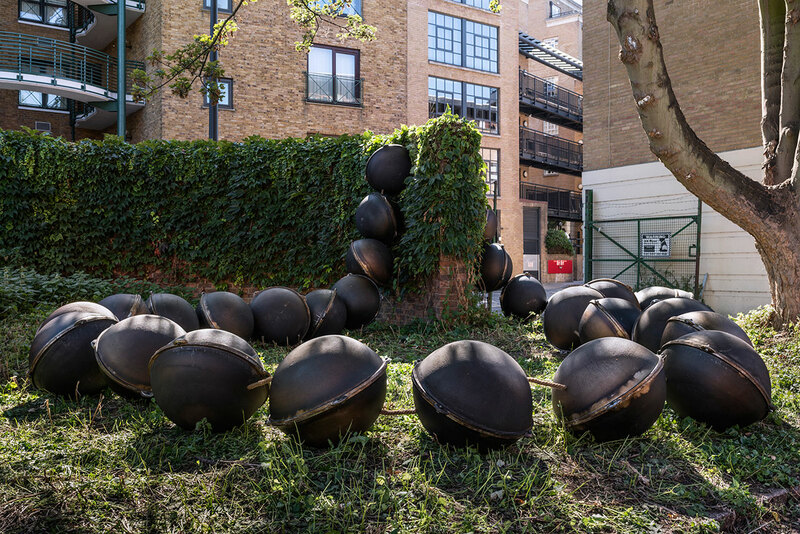 Similar issues of cultural identity are taken up by Askhat Akhmedyarov's outdoor installation “Azhenin Kozi”. Inspired by a hemispherical pot that is ubiquitous in Kazakh households, Akhmedyarov has created an oversized bead necklace that references the type of gift that older women in Central Asia pass on to their daughters as amulets. 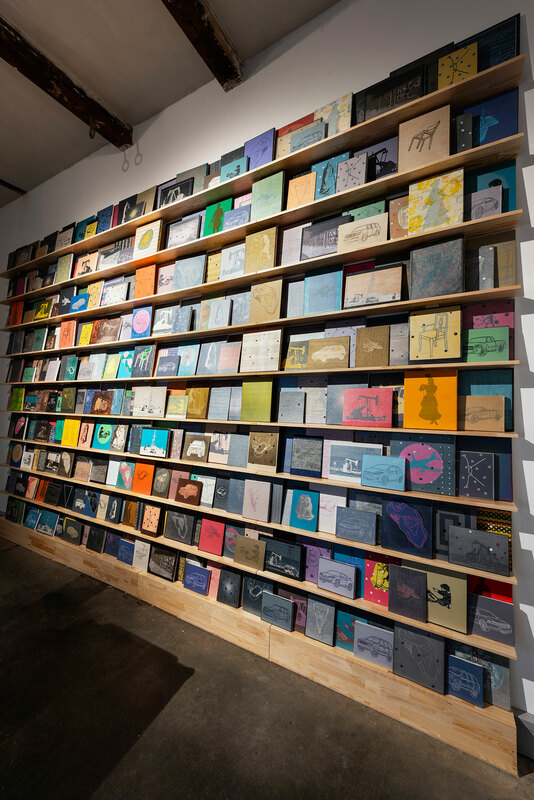 Asel Kadyrkhanova also uses historic documents for her installation titled “Machine” (2013), in this case thousands of arrest warrants that pay tribute to the victims of Stalin's terror in the 1930s. 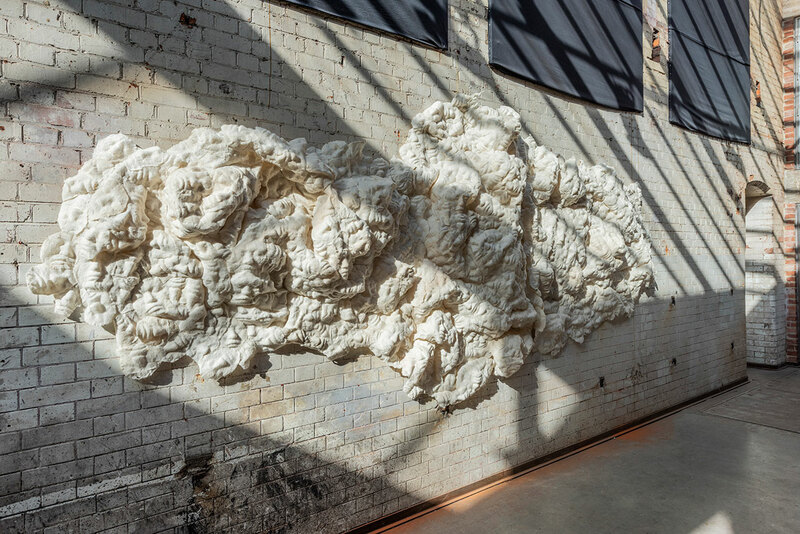 Pinned on the wall with their data erased, the warrants are connected by countless red strings to a typewriter in a symbolic declaration of how an ordinary bureaucratic act in a totalitarian society can easily turn into a well-designed mechanism of destruction. Focus Kazakhstan: Post-nomadic Mind, installation view of Gulnur Mukazhanova’s "Mankurts in Megapolis". Photo by Thierry Bal. Focus Kazakhstan: Post-nomadic Mind, installation view of Gulnur Mukazhanova’s "Mankurts in Megapolis" (detail). Photo by Thierry Bal. Focus Kazakhstan: Post-nomadic Mind, installation view of Galim Madanov and Zauresh Terekbay’s “Transgression” (2007-2011). Photo by Thierry Bal. Erbossyn Meldibekov’s sculptural work “Communism Peak” (2009) takes its cue from one of the mountain peaks in the Pamir range in Central Asia, the highest in the former USSR, which in the last 130 years has been renamed six times due to political reasons—unsurprisingly, at one point it was named after Stalin. 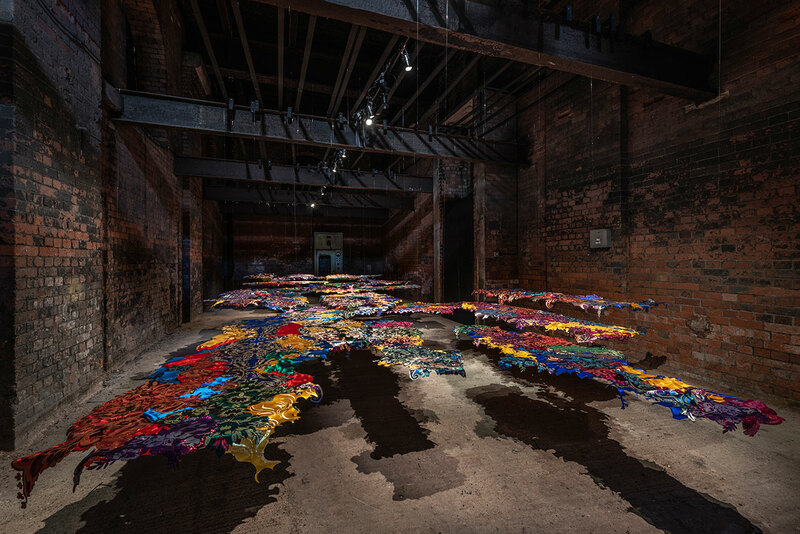 Made out of enamelled metal pots that the artist has deformed and turned upside down to resemble snow-covered mountains, the installation satirizes the utopian aspirations of the former Soviet leaders and the flow of history. 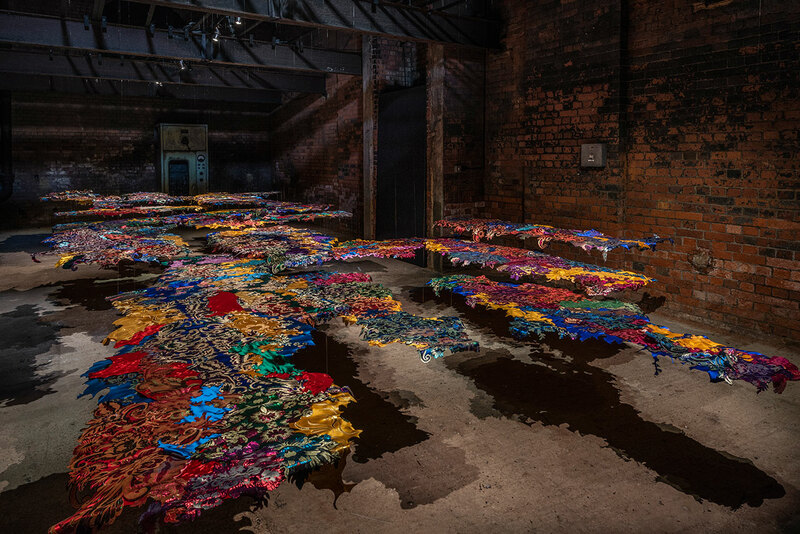 Undoubtedly, one of them most impressive works in the exhibition is Gulnur Mukazhanova’s labyrinthic installation “False Hope or The Momement of the Present”, a suspended landscape made of shiny yet impractical fabric used in Kazakhstan as gift wrapping during weddings and other celebrations. As the title indicates, the work is a mataphor for the illusory value of gifts, and by extention the information, we exchange. 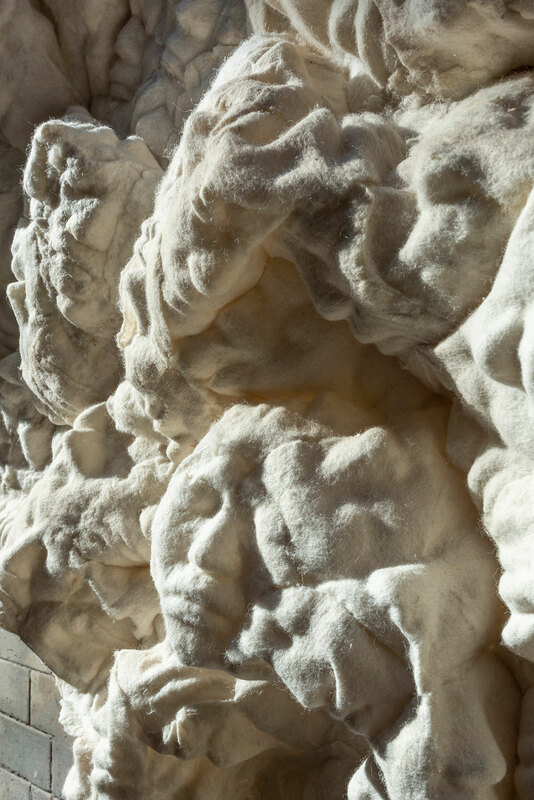 Similarly expansive but more visceral is “Mankurts in Megapolis” by the same artist, an white sculptural landscape inspired by traditional Kazakh wedding dresses that speaks of the loss of traditional values—mankurt being a person who under external pressure forgets his roots. Other notable works include artist duo Galim Madanov and Zauresh Terekbay’s “Transgression” (2007-2011), an installation of 250 small paintings reflecting on the sudden and intrusive changes in Kazakhstani society imposed by modernity, Almagul Menlibayeva’s video work “Butterflies of Aisha-Bibi” (2010) where the artist stages and films complex mythological narratives, and Kamilla Gabdullina’s suspended nebulous installation titled “Oelun” (2016), a Turkic word for cloud that is also the name of Genghis Khan’s mother. Focus Kazakhstan: Post-nomadic Mind, installation view featuring Galim Madanov and Zauresh Terekbay’s “Transgression” (2007-2011). Photo by Thierry Bal. Focus Kazakhstan: Post-nomadic Mind, installation view. On the foreground Kamilla Gabdullina's "Oelun" (2016). On the background from left, Dauren Kasteev "First militia" (2016), part of triptych "The years of great distress", Pavel Zaltsman's "Warriors of Amangeldy" (1956), Syrlybek Bekbotayev’s "Mothers" (2018) from the series “The Modernist Paradigm", Moldakhmet Kenbayev's "The song of the shepherd" (1982). Photo by Thierry Bal. Focus Kazakhstan: Post-nomadic Mind, installation view of Vladimir Eifert's painting "The Storm of Virgin Lands" (1954) hanged in front of Saule Dyussenbina's bespoke wallparer. Photo by Thierry Bal. 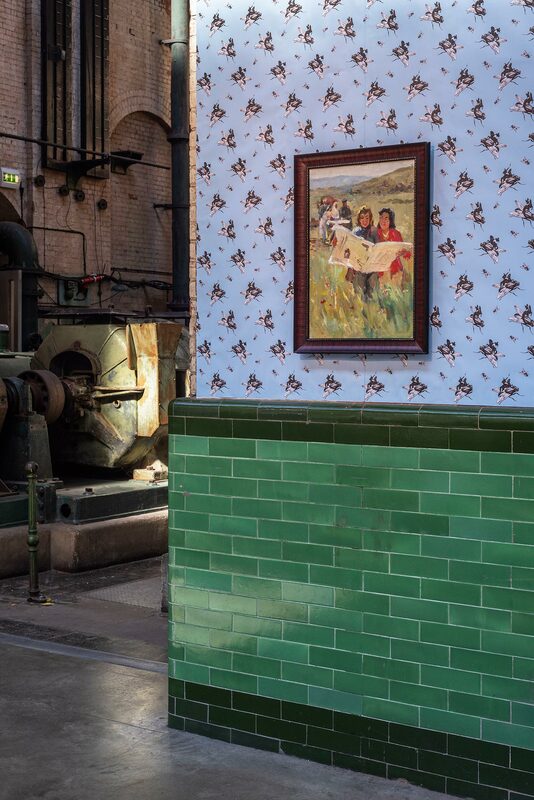 Focus Kazakhstan: Post-nomadic Mind, installation view of Kanafiya Telzhanov's painting "No News 1941" (1961) hanged in front of Saule Dyussenbina's bespoke wallparer. Photo by Thierry Bal. The exhibition also includes artworks from an older generation of artists who flourished during the Soviet era such as painters Abylkhan Kasteev, who is considered the founder of Kazakh art, Moldakhmet Kenbayev whose work praises the steppe as a source of life and beauty, and Kanafiya Telzhanov who painted both monumental canvases with a historical subject matter and small poetic paintings of everyday life. One of the latter, “News 1941” from 1961 is cheekily displayed against Saule Dyussenbina’s contemporary wallpaper whose humorous motifs are drawn from Kazakh folk traditions and myths, as well as architectural views of the new Kazakh capital, Astana. But perhaps the most poignant meeting of the Soviet and post-Soviet generations occurs in Syrlybek Bekbotayev’s dynamic work “Mothers” from his series “The Modernist Paradigm” (2018). 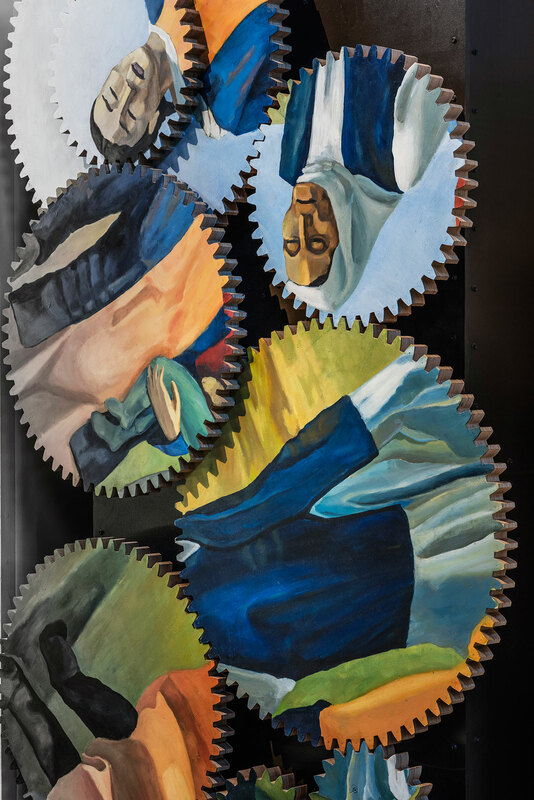 Conceived as a moving gear mechanism, Bekbotayev has painted - on each wooden cog - a fragment of iconic Kazakhstani artist Salikhitdin Aitbayev’s 1974 painting of the same name, also included in the exhibition. 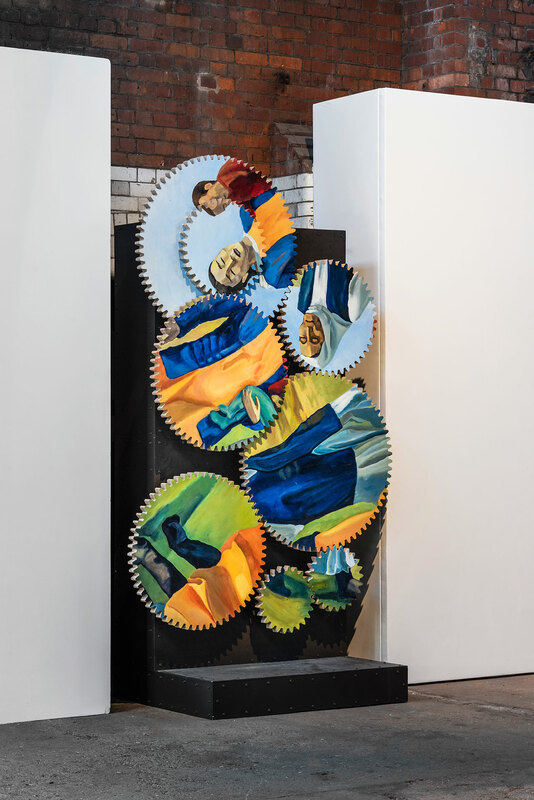 As the gears turn, the painting is deconstructed and reconstructed symbolizing the recurrent nature of art, whilst also alluding to Kazakhstani society’s continuous re-calibration of its past in order to define its post-nomadic present. 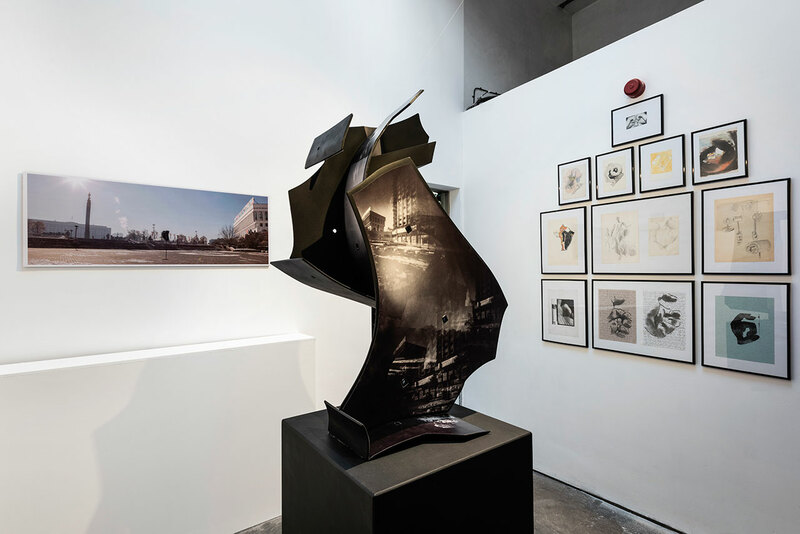 Focus Kazakhstan: Post-nomadic Mind, installation view of Syrlybek Bekbotayev’s "Mothers" (2018) from the series “The Modernist Paradigm". Photo by Thierry Bal.